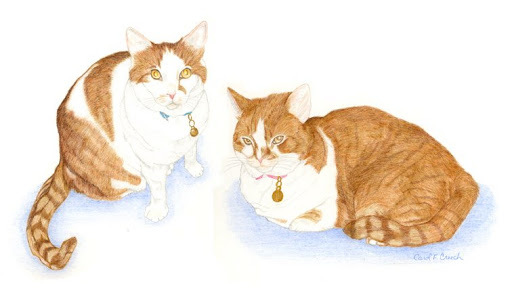 Two Cats in colored pencil – finished at last! I have finally finished the portrait of the two cats. Whew! It was a long process, but I am very pleased with the result. The final image is about 8.5″ high X 15″ wide, so I had to scan each cat in separately and combine them in Photoshop to get them all in one image here. I added some shading in blue underneath each cat to give them some grounding within the drawing. I chose blue because it contrasts nicely with the orange color of the cats, and in one of the photos I worked from, the cat was sitting on a blue blanket. i absolutely LOVE seeing the WIPs on this — such stark contrast that i wouldn’t have believed it without the different steps! Thanks, Jill! I am always sort of amazed, myself, when it all comes together in the end. Glad you enjoyed seeing the steps along the way. I find that really helpful when I look at other artists’ work. As the owner of the two cats, I have to tell you that your drawing of them is absolutely perfect! You captured the nuances in color and the expression on their faces with such detail. It’s as if I am looking at them in the flesh. Thank you! This is beautiful!I’m always impressed by people who can create art in colored pencil. I find it impossible! You’ve got quite a talent. Thanks, Laura! I really appreciate the compliment. I love the finished drawing! Wonderful.